Connaught Green with Stone leather interior and weather equipment. Sliding side screens, wood rim steering wheel, heater, wire wheels and luggage rack. 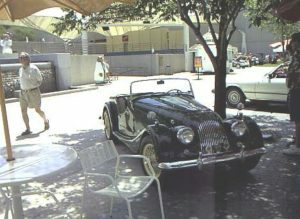 Dispatched from the Morgan Factory on February 12, 1964 to Fergus Imports, New York. When I bought the car it looked a whole lot worse than it really was. Everything wrong was an appearance issue. The paint was peeling and primer was showing but the body was in excellent shape. The upholstery was stained and cracked. And I didn’t like the green car with yellow wheels. One of the very first tasks was to paint the wheels silver. Then the gas tank started leaking. First I learned that there is a way to take the gas tank out of a Morgan without having to take the whole car apart. Next I learned that the local radiator shop is not always good at fixing leaking gas tanks. Then finally I learned that buying a new gas tank can be cheaper and easier that fixing the same tank several times. The next few years we drove the car in warmer months and spent the winter working on upgrades and repairs. That worked out pretty well but we got that all wrong in 2005. We went to the New Orleans British Car Show in March. It was a whole lot colder and wetter than anyone expected. I knew the top wasn’t in the best of shape but I didn’t think it was as bad as it was. I think we used every towel we owned trying to stop the drafts and leaks in the passenger compartment. After we survived the trip I did a bit of searching and found a good local upholstery shop that custom-made a top exactly like the original. And it works at keeping out the weather. It seems like there was always something that could use some attention over the winter. The biggest project was repainting the car. And it was not a high priority so I saved it for last. It was simply a bad paint job and it was deteriorating. The body was in good condition and not rusting or anything. It just looked awful. 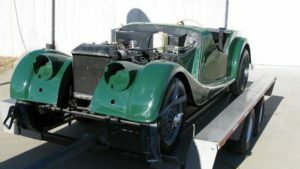 The task was complicated by the fact that to properly paint a coach built body as on the Morgan is to remove the fenders and doors and paint everything separately. That is twelve separate panels on the Morgan. And that doesn’t include the inner panels and brackets. This is picking up the car at the painters and taking it home to put it all back together. 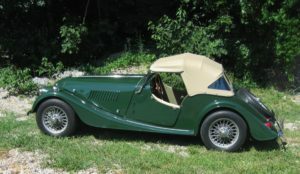 This is how my 1964 Morgan +4 looked when I first saw it in July 2002. This was an informal car show at the Kansas City Crown Center fountain area. 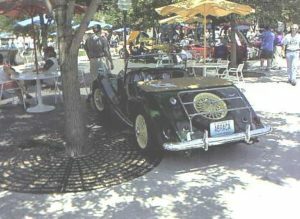 I was there with the Kansas City MG Car Club and my 1949 MG TC. A lady pulled up in this car and promptly disappeared. I liked the car as it was exactly the same model car I owned 25 years earlier but in much better condition. 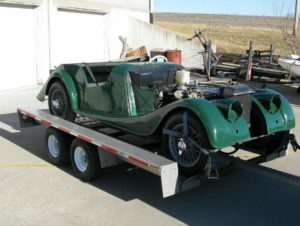 My first Morgan was barely roadworthy while this car had less that 20,000 miles and what looked to be a really solid car with a truly awful paint job. I took a couple of photos to show my wife. Little did I know but a few weeks later the car showed up for sale in the local paper. After few unusually frosty August nights, I bought the car. I rolled over 20,000 miles on the short ride home. The car had only been driven 5 thousand miles over the last fifteen years and there was a lot of ‘deferred maintenance.’ Most of it was minor issues. The car was as solid as it seemed. The wood and metal all good. The paint and upholstery—not so much. The car was a complete factory leather interior kit which helped a lot. The first priority, though, was the leaking gas tank. And thanks to the internet I learned that there is definitely a trick to removing and replacing a Morgan gas tank. The next thing I learned was that the local radiator shop can’t always fix leaking gas tanks. The final thing I learned it that a new gas tank is cheaper than repairing the old one several times. The radiator shop did a better job with the leaking radiator. Not 100% as still dripped a little. It was good enough to use while working on other projects. 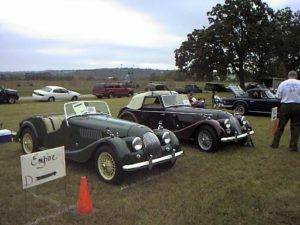 My first out-of-town trip with the car was to the Brits in the Ozarks car show in Fayetteville, Arkansas. The car was not ready for a car show. But it looked like it would be a fun show to attend. And I was right. 2002 was the first year of the show and they have held the show every year since. My Morgan and I have returned several times and have actually won a few awards over the years. The photo is from the very first show where they didn’t even have a Morgan class. Two Morgans were in the Empire class. The other Morgan won. The next year a group of Texas Morgans came with more than enough Morgans to form a class. The next trip on the list was to a National Morgan Show. When I had my first Morgan 25 years earlier, I joined all the clubs but never made it to any of their big events. I was a serviceman stationed in Texas and most of the events were on the coasts. Way too far to go in my broken down car. 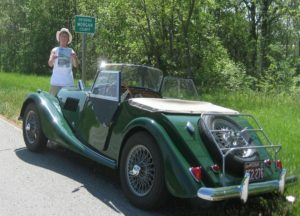 We decided to go to Shepherdstown, WV for the 33rd Morgan Owners Gathering of the Morgan Car Club, DC in July 2003. Shepherdstown proved to be an interesting Civil-War era town. Interesting enough that we went back in two years. I spent the next few years driving the car in the Spring and Summer and worked in the Winter on repairing and replacing those parts that always seem to wear out after 40 years or so. I already mentioned the gas tank. In 2003 I got a new stainless steel exhaust system. 2005 was the year we got a new top. It started out simple enough. We decided to go to the New Orleans British Car Show in March. Several people from Kansas City had been there in previous years and said it was a great show. They were right. It was a great show. Only the weather was wet and chilly. And the worn-out Morgan top was not up to it. We used practically every towel we had trying to plug drafts in a futile attempt to stay warm and dry. After we got back we found a local upholstery shop that specialized in hot rods that made a top to the original design that fits perfectly and we have not had any problems since. Some time in the early 2000s, I also replaced the generator, water pump and put in a high torque starter. One of the first things I did was to paint the wheels silver. Neither my wife nor I liked the green car with yellow wheels look. In 2009 I finally got serious and repainted the car. I don’t have any ’before’ photos showing the badly peeling paint especially on on the rear deck. I didn’t paint the car myself but I took the interior out and took off the fenders so the job could be done right. The sheet metal and wood was all in good shape. No bodywork was needed anywhere. The chassis did have some kick-up at the rear so it was straightened and reinforced under the rear axle. 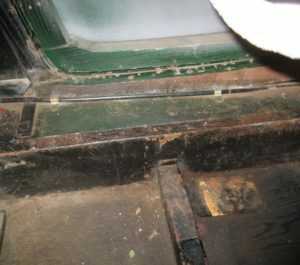 I was really happy when I saw the condition of the sills when I took out the interior. The wood is great. I didn’t have to do any patching on the wood anywhere. Here I’m collecting the car from the paint shop taking it home to put it all back together. This is what the car looked like as I was taking it apart for painting. The inner valences and all the brackets were powder coated. It is eventually going to need an engine rebuild if for no other reason than to fix all the oil leaks. The last big project was a cylinder head rebuild. I knew the valves and seats were bad and I expected to have to rebuild the engine but everything else was good. The only other pending maintenance project is to rebuild the front suspension. I have the new parts on hand. I keep thinking that I’m going to need to replace the kingpins and bushings but they seem to do fine if I keep the chassis lubricated. A Morgan always needs some TLC. It is not Toyota Corolla. satisfied that Morgan was well-supported by MOSS as they use a lot of the same parts as many cars listed in the MOSS Catalogs. Now we are waiting to see how well we did in 2017 and what is in store for 2018.